Extensive work has been carried out on the properties over the previous, 10 years including as recently as this year. A review of this prior work is being undertaken by the Company’s geological team. A news release containing their findings will follow. 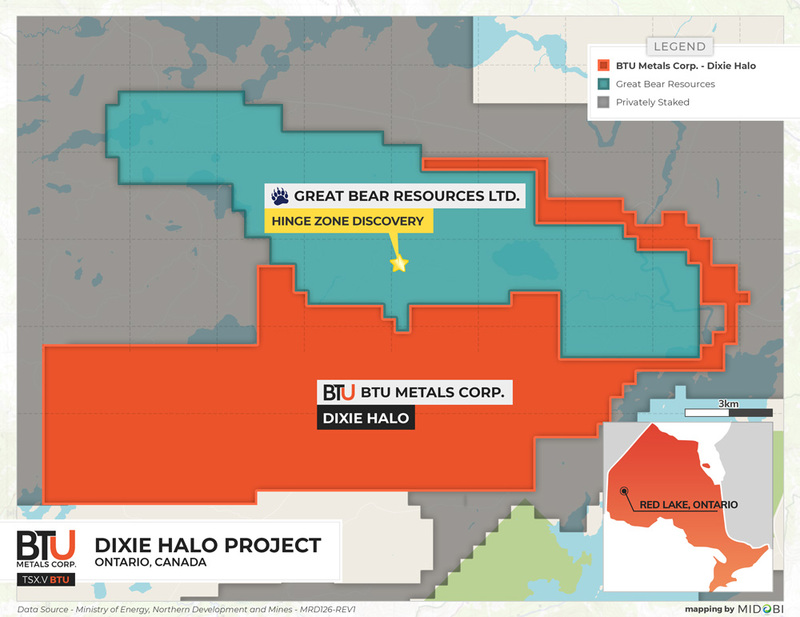 To view a map of the Dixie Halo South and the Dixie Halo South East please visit http://btumetals.com/projects/Dixie_Halo.pdf. The drill hole intersection reported on the property location map is not on the Company’s Dixie Halo Property. Mineralization that may be hosted on adjacent properties are not representative of mineralization that is, or may be, hosted on the Company’s Dixie Halo Property. Cumulative terms call for the Company to issue a total of 12 million shares and cause expenditures of $2,500,000 on the properties over a period of 24 months. A 2.5% NSR will be granted to each vendor with 1% purchasable by the Company at any time for $2,000,000. Advanced royalty payments totalling $6,000 per year shall commence after the 5th year. This transaction is subject to TSXV approval.